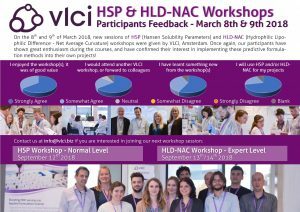 Our HSP and HLD-NAC workshops of 8th and 9th of March 2018 were again a great success! It is really nice to see that more and more formulators and ingredient suppliers are willing to work with predictive formulation science! More sessions to come on September 12th, 13th and 14th; let us know if you are interested in joining!